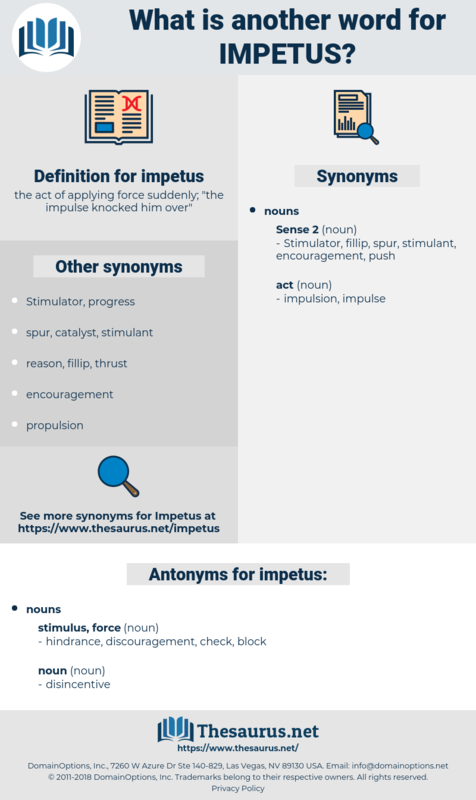 What is another word for impetus? the act of applying force suddenly; " the impulse knocked him over"
stamina, enthusiasm, motive, inspiration, promotion, outpouring, incitement, strength, vigour, engine, stimulant, surge, nudge, enticement, contribution, spirit, power, pulser, excitement, breath, suggestion, springboard, motivator, vibrancy, upturn, triggers, kick-start. stimulus, incentive, boost, encouragement, motivation, fillip, push, dynamism, thrust, drive, spur, inducement, catalyst, stimulation, dynamic, instigation, initiative, zest, vitality, momentum, force, driver, behest, trigger. The impetus of being good - looking by an effort of her own had blackened the copper colored eyes. The impetus afforded by this extraordinary development of painting continued to affect the sixteenth century and a greater part of the seventeenth.